Reformed Baptist Seminary enters its fourteenth year of providing a seminary education in a flexible online format and for an affordable price to those preparing for gospel ministry. We refer to our seminary as "church-based" for three reasons: first, the seminary is under the oversight of six local churches. Second, nearly all our instructors are currently engaged in pastoral ministry or missionary labor. Third, we intentionally work with the leadership of the student's local church to ensure he is discipled and mentored in the context of his own local church. RBS started in May 2005 with nine students. During the 2017-2018 academic year, our enrollment exceeded 100 students. The nine students who graduated over the last year, which you can read about by clicking on their names below, include the following: Gustavo De Barros (MTS), Scott Stake (MTS), Ronald Dickson (MTS), Jeremy Cooley (MTS), Ian Turner (MDiv), Massimo Cigoli (DTS), David Torres (MTS), Josef Urban (MTS), and Mark Culton (MTS). This brings the total number of graduates to 60, many of whom are currently serving as pastors or missionaries and others as gifted laymen in their local churches. RBS's growth has placed great demands on our administrative capacities. After careful research and prayer, we decided to transition from PathWright, a stand-alone Learning Management System, to Populi, a full College Management System that integrates student information with its own learning management system. Populi provides a more integrated and robust online experience, from paying your tuition and fees, to using the online campus, to requesting transcripts, and even aiding your interaction with fellow students (e.g., job boards and discussion forums). Not surprisingly, Populi is used by many theological schools and colleges. Better student and course integration may enhance the transferability and recognition of RBS coursework and programs. Moreover, should RBS decide to pursue full accreditation, Populi’s more standardized course format will facilitate that process. For these and other reasons, we are excited to offer this product to our students! RBS has partnered with Puritan Reformed Theological Seminary to offer the PRTS Transfer Program. This academic program is available to applicants who have been accepted into graduate programs at both RBS and PRTS. Students who desire to continue their education after RBS are encouraged to consider this unique partnership with PRTS, since their programs are accredited by the Association of Theological Schools. The student is not required to complete a degree at RBS, and may transfer a maximum of 20 pre-approved credits to either a Master of Arts or Master of Divinity at PRTS. Last fall (2017) Dr Bob Gonzales taught Old Testament Introduction as a joint module for RBS and Grace Bible Institute in Conway, Arkansas. The module was well-attended and hosted by Grace Bible Church of Conway. In January of this year, Immanuel Baptist Church of Sacramento, California, hosted a module on Modern Church History, which was taught by one of RBS's professors who serves as a missionary in Asia. Then, at the end of March, Grace Community Church of Minden, Nevada, hosted a five-day module on the Doctrine of Salvation. Pastors Brian Borgman and Jeff Smith served as the instructors, and they addressed the various topics related to the application of salvation to the elect, including the ordo salutis, union with Christ, effectual calling, regeneration, conversion, justification, sanctification, perseverance, assurance, and glorification. The lectures from the three modules above were recorded and uploaded to update our media on our online campus. RBS plans to offer a module on Medieval Church with Dr Michael Haykin and Pastor Robert Elliott serving as lecturers on January 8 - 10, 2019. Immanuel Baptist Church of Sacramento, California, will host the module. Students and auditors are welcome. For more information click here. In the mid-2000s RBS provided theological training to pastors and aspiring pastors in Santiago, Dominican Republic, in the form of five-day modules four times a year. Twenty-three men graduated from the "Marrow of Theology" program in 2007. A handful of those men started La Academia Ministerial de la Gracia (AMG) to train others in the DR and from other countries throughout the Caribbean and Latin America. On June of this year, AMG completed its tenth academic year with 18 graduates, bringing the total number of graduates since 2008 to over 130. 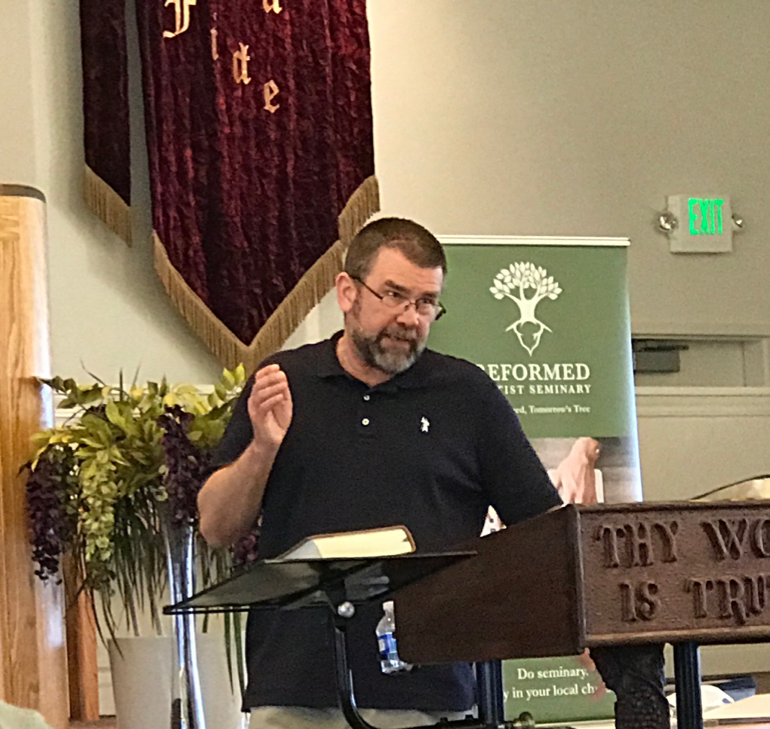 Pastor Greg Nichols taught the students covenant theology the week prior to the graduation ceremony, and Pastor Lou Sloger gave the graduates a pastoral charge. Additionally, RBS and AMG conferred on Pastor Lou Sloger an honorary Diploma of Ministry in light of his involvement with and his church's support of AMG as well as a local orphanage ministry Fundacion Red de Misericordia (The Net of Mercy Foundation). In March, Pastors Nicolas Alford and Doug Van Dorn served as the inaugural teachers for a new pastoral training partnership between RBS and HeartCry Missionary Society. The location was Nepal, where through the ministry of Paul Washer and some other Reformed influences, there is a small community of healthy churches seeking to plant new works in the mountain villages and urban centers of this amazingly beautiful but spiritually dark nation. This first class was a systematic study of the doctrine of the Word, emphasizing the modes of revelation, the attributes, history, and application of Scripture, as well as several sessions on sola Scriptura in the life of the church and the right use of a confession of faith. It was a delight to provide copies of the 1689 Baptist Confession of Faith to these pastors, in their own language, and see them receive it with enthusiasm. We pray the Lord blesses these efforts as RBS continues in this strategic gospel partnership with HeartCry, and with these Nepali pastors. If this multiyear training effort is something you would like to support or be more involved in, please contact us. How can RBS offer a ministerial education at such a reduced cost? Part of the reason lies in the fact that we are an online school. We do not need to charge the student to maintain the overhead expenses of building facilities and a resident faculty. Another part of the reason lies in the fact that RBS is partially supported by the generosity of local churches and Christians in local churches who see training gospel ministers as a vital component of the Great Commission. If you are interested in knowing more about our financial needs, please contact the seminary dean (dean@rbseminary.org). RBS is a 501(c)3 tax-exempt organization. When donating, please indicate what fund you would like to contribute towards.